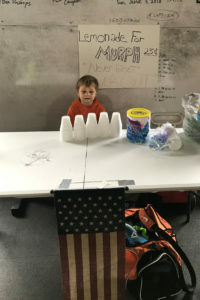 We would like to introduce you to a very special young man named Nicky who raised money for LSF in honor of LT. Michael P. Murphy at his lemonade stand. Thank you, Nicky! Never Quit! I have been doing the Murph challenge for the last 3 years. The first year, I asked to speak to the group about what it means and why we do it. Last year I was asked to speak again. This year, it was my son’s event so I was going to speak for the third time. In the past, I talked about who Murph was and how it had motivated me to do CrossFit as I was 365lbs and headed the wrong way. But this year I changed it up. I have been a fan of Marcus ever since my brother gave me his book a few years ago and I have been listening to the Team Never Quit podcasts every day since last December. When I heard the podcast with Don Raso, I knew I had to change it up and take the focus off of me and put it on the men and women who deserved the attention. This year’s speech was about honor and what it truly means to honor those that fought for us. I talked about Murph and Operation Red Wings and told everyone that funds would be split between the 2 foundations! Nicky was able to raise $450 from the gym and a few other people who couldn’t be at the event! From the bottom of my family’s heart, thank you for all that you guys do for this country and for those who fight and sacrifice for us to live the lives we do! If you have an LSF story that you’d like to share, please email us!